"Because a newborn has limited control over his body, Mother Nature equipped him with many innate survival skills. These reflexes, while necessary, can make him seem like a bundle of nerves—twitching, jerking, and kicking at odd times—but they’re actually signs that everything is working just fine. Many of these primitive responses will disappear in a few months as your baby’s body becomes more organized and he no longer needs them"
No longer needs them?! Whaaaaaaaaat? I beg to differ. Now is actually the perfect time to use and develop these skills, while baby is laying the foundation for his life. "This is not about manipulating variables to create a physically superb child, or about being an over-zealous parent. So many books and websites talk about letting a child develop in a natural way. I couldn’t agree more. But the big, huge, gray, wrinkly, ELEPHANT IN THE ROOM is that we do not live in nature — and what we are calling “natural development” is actually extremely stunted and limited based on our modern lifestyles." How stunted? Well for starters we strap our babies down at birth so that they forget their innate reflexes - Parent Magazine said so :) Plus, we strap them in bucket slouches. Then we strap shoes on them before they can walk so that they don't develop foot strength. Then they learn to walk in big bulky diapers, which push their legs out from their pelvis' in an abnormal angle. Plus, nowadays, many kids don't even really want to move when they could be on screens instead (and more bucket slouches). Catching what I'm throwing? That although this is a so-common-we-call-it-normal development pattern, it's not normal by truly human standards. Imagine a wolf pup being raised in a zoo (the size of your living room) versus the forest - which one do you think is going to have alignment issues? This is one reason why childhood bio-mechanical issues such as gait, foot, ankle, knee and hip problems are on the rise. Whatever spin, kids and tiny babies alike should naturally want to move, play, and be, well, annoyingly boisterous. But when we strap shoes on before they can walk, keep them indoors (where they constantly watch us on computers, phones, and screens), and then see us “exercising” in ways that sure don’t seem fun … how could we actually expect them to think otherwise? Indigenous cultures are all about the moving baby. In fact, many of these cultures see an unhappy baby as an unmoved baby, so instead of offering food they first offer the baby a new position. Knowing this actually allowed me to avoid numerous meltdowns when I had no idea why baby boy was so upset. In fact, it's important to allow your baby freedom of movement from birth since it's somewhat a race against time as they gain weight. Can you imagine fully doubling your weight in two month while you sit on the couch, and then being forced to do a push up? No. No you can't. Neither can your baby. Doing these fun activities with your little one from the getgo will help develop his or her strength before your baby "loses" (i.e.forgets) the innate reflexes they're born with. They're also a really fun way to bond with your baby more than breastfeeding which, I'll admit, becomes a little tedious when it's all you feel like you do. Have fun with these games, and always stop before your baby is tired or cranky in any way. Allow baby to grab your thumbs while you gently pull him/her into a standing position. Never pull them by their arms or wrists, but instead make sure this is all about their own grip strength (otherwise you can pull their ligaments). If you start cultivating their grip like this from birth, baby should be able to pull to standing like this at 10 or so week. In the meantime, just allow them to use their grip for as long as they can, which at first will be for about a second or so at a time. Let them figure it out in their own time, but always offer them the opportunity to grab your thumbs. Allow baby to grip your thumb while you pull him/her over to the tummy. Then you can have them grip your thumb again as you roll the back onto their backs. Again, never pull them by their arms or wrists, and instead let them use their own grip and body mechanics to learn this movement. That means they'll only be able to roll over after they're strong enough to hold their body weight on your thumb, so start playing around with this from week 1. My own Elias LOVED this game. You probably hold your baby a lot, so it's fun for both of you when you put the control in your little one's hands. Very carefully of course! But after 2 weeks or so after birth, when Elias had worked up a bit of head control, I would hold my hand a little away from Elias' back so he would have to hold on to me instead for support, yet I could easily grab him with any sign of slipping. Bit by bit he learned, and now will cling to me like a little lemur monkey (not that I know anything about lemur monkeys...but they sure are cute!). Now I can use a free hand for, ohhhh I don't know, DOING ANYTHING I WANT persay, and he can use his baby muscles to hold on to me instead. The cool thing about this is that when babies use their arm and chest muscles like this, it in turn helps them breath deeper. So they get energy out (read, sleep better), breath better, plus develop stronger and more dynamic musculature. Too much stimulation is overwhelming to baby brains, which is why babies will look and observe something, then look away. The "look away" is important for processing and understanding, just as allowing your baby free time to play is necessary for them to put their skills together. Here Elias is figuring out all on his own how to quadrupe at 12 weeks (notice, diaper free), something you as a mother can't teach him. You can lead a horse to water ... but the baby must learn how to move on his own. This is important for two reasons. First, because baby seeing you moving and having fun will actually make him/her want to have fun on the floor too. So many babies hate tummy time - probably because they feel alone and scared on the floor. If you're on the floor with baby doing neat poses, baby will like being on the floor too. Secondly, after you have a baby your body can feel like a limp noodle. Mine did. Even worse, a limp gluten-free noodle. After the intense labor and then 2 months of breastfeeding on the couch, I know I was stronger and in better shape at ten months pregnant, which was frightening. That’s why it’s great to use your baby activity time to do mom-activity time too. 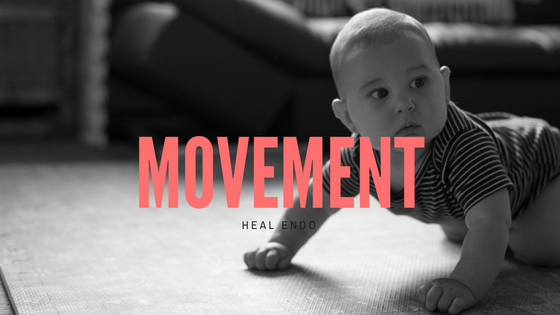 Get on the floor with baby and do some down dogs, some leg lifts, maybe some Heal Endo strengtheners, or some what-ever-you-wants. Honestly, the more you slowly wake your musculature back up the happier you will be in a few months when your little one suddenly crawls away. Natural Movement experts ask us, did we develop our chronic bucket slouches from sitting, or are we sitting in bucket slouches because we developed in them? Translation - did all these baby contraptions force us into bucket slouches from the getgo? It’s a good question to ask as a mother, since I really see these everywhere! Car seats, swings, Rock’n’play, strollers, high chairs, baby seats, the list goes on. Basically if a baby lays in it and it’s not a crib, it’s probably a bucket slouch. The other devices that may mess with baby’s biomechanical development are walkers, bouncers, and poorly designed baby carriers. Even learning to walk in diapers is another “contraption” that acts the same as these walkers. look at those displaced thigh bones! Why are these so hard on baby joints? Here’s the deal - babies aren’t born with hip sockets. Wierd huh. Instead, they rely on crawling to dig out the socket in one direction, and then walking to dig it out the other way. When baby is forced to walk with a big bulky device between his legs - be it a walker, a bouncer, or a diaper - his hip sockets may be dug out in odd angles. Plus his feet, ankles, knees, and hips will be displaced at awkward angles at the exact moment s/he's learning to walk for the rest of their life. I will admit, though, these devices do make life a little easier. I had a baby swing and would put Elias in it for 20 minutes or so until he ordered me get him out, and I relished those 20 free minutes as an exhausted mother should. The concern is when your baby is in a bucket slouch all day long - like, if you're moving them from contraption to contraption. Best place for babies? FLAT floors, cribs, couches, etc, or being held in arms. Leave the walkers and bouncers at the store, and make sure you're diaper free when doing your standing or walking activities. This is also why a nice non-toxic play mat can be helpful, because you can put the baby on there to play diaper-free and easily wipe up messes. I am a Nutritional Therapist, certified though the Nutritional Therapy Association, but I am not a dietitian, doctor, or medical professional, and this site is solely for guidance and information to give people more information to make an informed decision about their own bodies best treatment plan. Please check with your doctor, pediatrician, or care provider before making changes in your life or that of your baby's.